Pisa is near the intersection of two highways: the A12 which runs from north to south (Sestri Levante - Livorno) and the A11 which runs from east to west (Pisa - Florence). It is advisable to take the "Pisa Centro" exit on to the Fi-Pi-Li dual carriageway and then the "Pisa Nord Est" exit and follow the directions on the map from the south and east. If you are coming from the North it may be preferable to take the "Pisa Nord" exit, continue on the Aurelia road to Pisa and from there the directions on the mappa da nord. 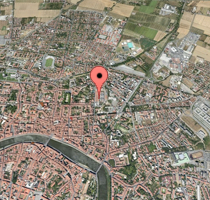 Please note, Pisa is a small town with many pedestrian and limited traffic areas. Parking is a problem and most of it is paid. The nearest car park is where the market is held: a 10 minute route on foot.